The villagers of Bathory seem to have uncovered the secret to eternal life, and it involves blood. Lots of blood. Unfortunately however, eternal happiness eludes them and, 2000 years after the Vampire Lord Bathor established the village, religious superstition and violence reign. The vampiric women of the village attempt to gain control from the holy men who routinely slaughter them, blaming all their troubles on Evil Female Flesh. Co-directed by Sophia Cacciola and Michael J. Epstein (who also wrote, produced, edited and photographed the film as well as fulfilling various other production roles), this lavish vampire yarn opens on a wide-eyed man condemning the women of Bathory for betraying Bathor, who he believes wished for them to be subservient to their men. It’s an infuriating diatribe, if only for the fact that his ugly dogma is unfortunately not exclusive to the onscreen world. It also sets the tone for a film which acts as an attack on those who bend religion to their own ends, and serves to highlight the detriment (to both men and women) brought about by patriarchy and male privilege. The blood-red titles that follow the opening soliloquy establish a gorgeous baroque feel and gothic aesthetic that dominates throughout. The film frequently resembles the work of Hammer or Amicus, with Technicolor-esque flares and sexploitation elements that bring to mind the Eurosleaze of Jess Franco or Jean Rollin. The titles also help to build a sense of theatricality, particularly prevalent during Blood of the Tribades’ first act, which sees loosely connected scenes fade in and out, each heralded by a folksy, medieval music cue. Dominant themes are also established early on, with a male villager (covered in welts; a plague blamed on the women) watching a vampire woman through her window as she bathes. He shoots an arrow bolt through her heart, but not before having a long, lingering leer. The man’s position is that of all the men in the film; that she deserved death for inflaming his lust with her naked flesh. The men in fact, blame all of their failings on women and in this respect, the film reflects some dark and depressing truths about our own society. The first half of Blood of the Tribades features a lot of this; the men, all armed with little wooden crossbows, stare longingly at the women before dispatching them with their diminutively phallic weaponry. It takes a while for any definitive plot thread to emerge and when it does, it does so fairly loosely. Lovers for the ages, Élisabeth and Fantine, first defy and then lead the female counsel in leaving Bathory in order to prepare for the return of Bathor, restoring peace and freedom to their society. The world built by directors Cacciola and Epstein is an intricately weaved one; it has its own mythology, class system and social divisions, as well as introducing a fresh take on vampire societies. The locations also – the film was shot mostly around rural parts of Massachusetts – are jaw-dropping, giving the film’s self-contained world a sense of awe and scale that belies the meagre budget. The film as a whole in fact, is a considerable achievement visually, with meticulously considered shot compositions and a lush colour palette that enhances and foregrounds the colours of the natural world. Pink skies reflect in slivers of water and nature’s various shades of green seem to pulsate from the screen. While Blood of the Tribades is tough to fault in a visual sense, its period world is not always fully fleshed out, with certain actors delivering their lines with the inflections of 21st Century teenagers, not to mention badass vamp warrior Giltine doing battle in what appears to be leggings and a sports bra. A number of the performances threaten to break the film’s spell but curiously, do seem to add to the air of otherwordly surrealism that permeates. Blood of the Tribades is both a pretty and fun piece of offbeat melodrama, and an enraged feminist statement. The foolhardy men of the film lay all their problems and failings at the feet of women, exercising their unflappable presumption that they are good and righteous. As in our world, the men are mostly too short-sighted to see that the very position of privilege afforded to them by their gender is what restricts them, binding them to their ingrained societal roles. The women on the other hand, must fight to break from the constraints applied to them by their male-led society. The film is a warning about those who endeavour to enforce and protect the tradition of male privilege, and it drives its point home with its wry final moments. In other ways (and particularly on the acting front), it’s all a little silly, but then so are the films it takes its cues from. 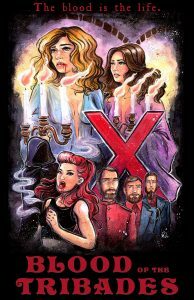 And if you’re looking for a film to double-bill with this year’s sexploitation throwback festival hit The Love Witch, you could hardly do better than this.